â—Â major components: recombinant human growth hormone and excipients. â—Â has been clear for the hypothalamus - pituitary disease and growth hormone deficiency caused by two different growth hormone growth hormone stimulation test confirmed a significant deficiency. The body naturally produces growth hormone (HGH or simply GH) in the pituitary gland, and, as its name implies, it is responsible for cell growth and regeneration. Increasing muscle mass and bone density are impossible without GH, but it also plays a major role in maintaining the health of all human tissue, including that of the brain and other vital organs. When secreted, GH remains active in the bloodstream for only a few minutes, but this is enough time for the liver to convert it into growth factors, the most crucial of which is insulin-like growth factor-1, or IGF-1, which boasts a host of anabolic properties. Scientists began to harvest GH from the pituitary glands of cadavers in the 1950s, but didn’t synthesize the first HGH in laboratories until 1981, with its use as a performance-enhancing drug becoming popular shortly thereafter. â—Â 2 ~ 8 â„ƒ from light and transport, can be stored for 30 days at room temperature, dissolved in liquid can be placed in the refrigerator for 2 ~ 8 â„ƒ for 72 hours. Pull 1ml of water into the syringe and inject it into the vial with powder. GH molecules are very fragile – sensitive to heat and rapid movements. You should never shake the vial when mixing. You should not inject the water directly into the powder with force, but rather let it gently slide down the inside of the vial. If it bubbles up, you should put the vial in the refrigerator and leave it there for about 15 minutes. The bubbles will be gone by then. You should then gently turn the vial between your fingers until all of the powder has dissolved (it takes about 3-4 minutes). The vials are under vacuum, so before you can take the GH out, you need to get rid of the vacuum. You take a fresh syringe, pull air into it and inject the air into the vial (not into liquid, but into air above the liquid). This will get rid of the vacuum. You can then pull out the GH as you need it. 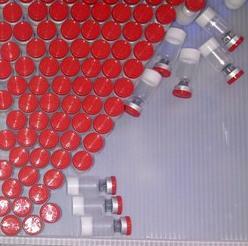 10 markings on the 100-mark syringe = 1 IU. Some people pull the entire HGH vial content into the syringe and use the same for 2-5 injections. Others prefer to use a fresh syringe for every injection (which is smart in my humble opinion). The favorite spot for HGH injections is subcutaneously, into the stomach fat – pinch some skin between your fingers and insert the needle at an 45 degree angle. Chose a different spot every time. Depending on the spot, you can either feel nothing or you can feel slight pain – you will learn your favorite spots in time. GH can also be injected into any muscle (thigh, shoulder, etc.) – it works the same either way. © 2016 Rocbio Store. All Rights Reserved. Powered by Zencart.